Get yours now! The first and only harness that was designed specifically for snowboarding but also works extremely well for skiing. Includes backpack, retractable leash with bungees and removable seat harness. 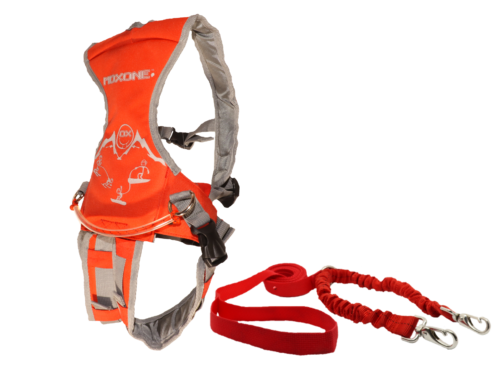 The MDXONE is a tether that combines a kids backpack for your young student and a retractable leash (MDX Leash) for the instructor. The MDX leash has a 16 feet retractable cord with 2 each 12” bungee cords at the end to connect into the MDXONE attachment points. Incorporated into the MDX leash is a mold hook which can be used to lift your student up after a fall or lift your student up on to the chair lift. The hook will also give you an extra 7”-8” which reduces bending over, especially during their first lessons. The hook can be used on either of the blue webbing taped lanyard. With the retractable leash, you can now decide the distance between you and your student with a simple push on the stop/release button with your thumb. When hitting the stop button, the bungee cord will extend slowly which will not cause a jarring effect on the student.